We visited some amazing spots in Rarotonga on our family vacation and I’m going to share my favourite Kid Friendly activities right here. Follow along for the entire series and hopefully you’ll get inspired to start planning your own Cook Islands adventure. 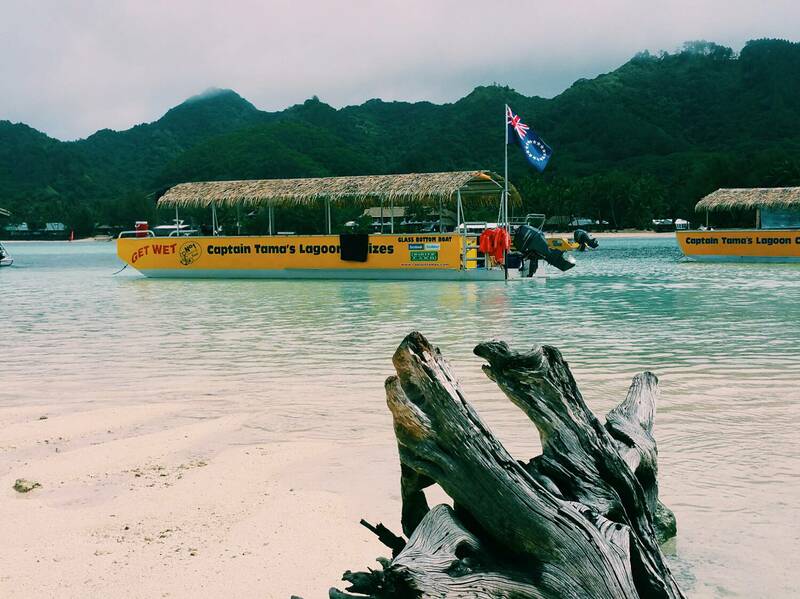 As soon as I mentioned that our family was traveling to Rarotonga, the first place people recommended if they had visited The Cook Islands before was Captain Tama’s Lagoon Cruizes. Not going to lie, when I checked the website I was SO freaking excited! After emailing an inquiry through and receiving a super quick response from Lynne, we scheduled our cruise for the day after we arrived in Raro. Of all the excursions we had planned, I was the most worried about how Nixie would survive such a long day – on a boat! We arrived to overcast, average day on Thursday which unfortunately deteriorated into a bit of a cold rain on Friday morning. 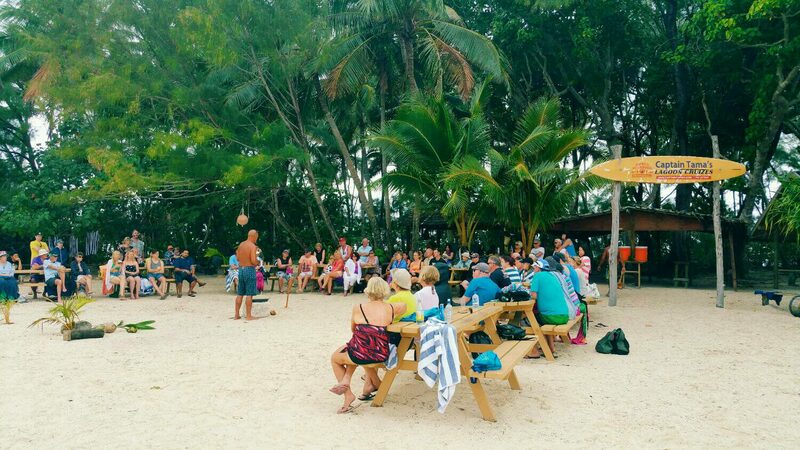 We were instantly cheered however, by the beautiful singing and drumming that greeted us upon our arrival at Captain Tama’s Muri Beach location. After a quick (hilarious) intro we boarded our glass bottom boat and headed out into Muri Lagoon to go snorkeling. The lagoon is quite sheltered so don’t worry about a bumpy ride, plus the pontoon style boats are super stable so no need to worry about feeling seasick. After a short spell of motoring, 15 minutes or so, we arrived at our snorkeling spot, stripped off and stepped overboard into the most beautiful water I’ve ever seen. People took their time, hopped in and out of the water, always assisted by one of the guides who stayed onboard, keeping a very watchful eye on all of their charges. We had packed a flotation ring for Nixon so Dave and I took turns exploring the reef below and hanging out with our little guy who had a great time bobbing around, chatting to everyone and pointing out all of the ‘whales’ he kept spotting! Ethan was in the water before anyone else and was the last to get back on the boat. He loved every second of it. One of the guides was in the water showing people where to spot two huge moray eels so that was the icing on the cake for our big boy. The fish were everywhere. We saw Giant Clams, Butterfly Fish, Trigger Fish, Damsel Fish, Blue Fin Trevally, Parrot Fish, Needle Fish and so many more. The incredible range and varied scale of marine life was so abundant that often you didn’t know where to look. We were all a little overwhelmed and so, so grateful for such a memorable snorkeling experience. There was another two year old on our boat and both he and Nix were totally happy throughout the lagoon trip. I couldn’t believe our luck that Nixon was relaxed and loving his time on the boat. This can definitely be attributed to the friendly, fun atmosphere that our guides made sure to maintain, even in the less-than-perfect weather. After another short spell of motoring we pulled up to a gorgeous island in the lagoon and hopped off for lunch just as the sun came out. The boats are flat bottomed so you literally disembark into ankle deep water. There was an elderly gentlemen on board that the guys took such great care of, carrying him gently to and from the boat so don’t worry about accessibility! We had about 20 minutes before lunch was to be served so Ethan grabbed a snorkel and headed back to the water whilst we explored the beach with Nixon and tried to ignore the incredible smells wafting from the BBQ. Women and children were served first, of course, and we were not disappointed. 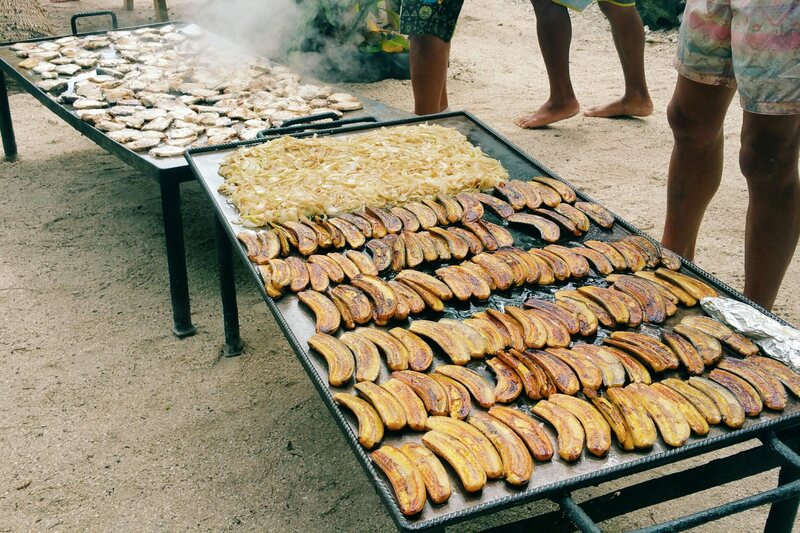 We feasted on fresh tuna, grilled bananas, onions, potato salad, coleslaw, bread, oranges and papaya with coconut. Ah. Maze. Zing. We all had seconds…….and maybe thirds. Ethan headed straight back to the lagoon and snorkeled his heart out for the next hour or so whilst we enjoyed a cultural performance including Rarotongan song, drumming, the complete coconut how-to guide from climbing the palm to making coconut cream, sarong lessons for both men and women and finishing with a hilarious haka. The day’s schedule was so well planned, there was value added at every transition. All five of us thoroughly enjoyed our day with the boys from Captain Tama’s Lagoon Cruizes. This is such a professionally run operation but one that retains it’s cultural authenticity. 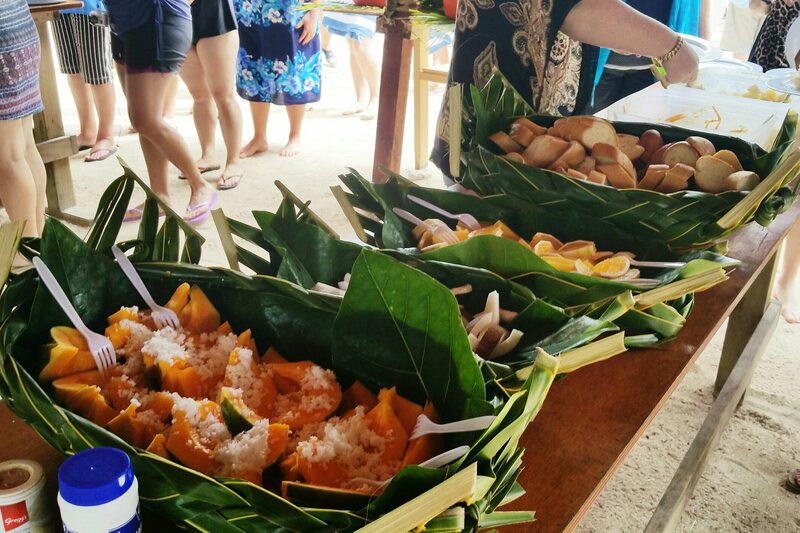 We are in full agreement that we would all pay to visit Captain Tama’s again on future holidays in Rarotonga, the total package (plus the amazing food!) was totally worth the ticket price. All you have to bring on board is a towel and a water bottle if you need one – all snorkeling equipment is provided. This is an excursion suited to all ages and after 12 days on the island I’m rating it a must-do (be prepared for tired kids – it’s too much fun!). * We were generously hosted by Captain Tama’s, however, all opinions expressed are my own. Oh Sir Bob, now you’ve gone & OFFENDED people!